The Southern Corn Bread recipe in Joy of Cooking is the cornbread that the book recommends for its cornbread stuffing. It’s delicious on its own, so I knew it would probably work well in Cornbread Dressing with Sausage. In November I saw a recipe for Cornbread, Sausage, and Pecan Dressing from Bon Appétit that looked terrific. 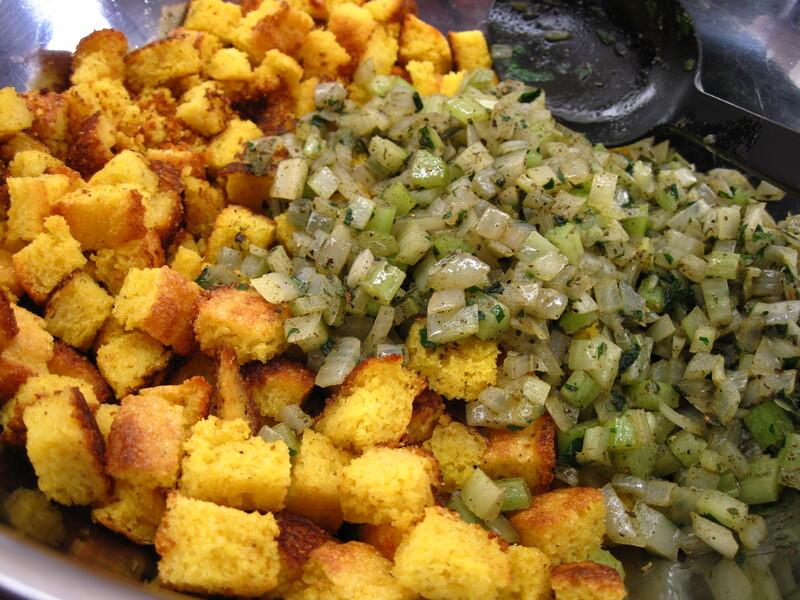 I ended up combining ideas from Bon Appétit’s recipe with Joy of Cooking’s Basic Corn Bread Stuffing to create my Cornbread Dressing with Sausage. This dressing was a great side dish with the turkey that I recently roasted, but it shouldn’t be reserved just for holidays. It would be a welcome side dish at any time during the cold winter months when comfort foods are so appealing. It would be just as good with a roast chicken, pork roast, or ham as it was with the turkey. I loved the Southern Corn Bread in this dressing. It’s made with 100% cornmeal and no flour, so it’s an excellent choice for those who avoid wheat and gluten. Plus, it was just delicious! 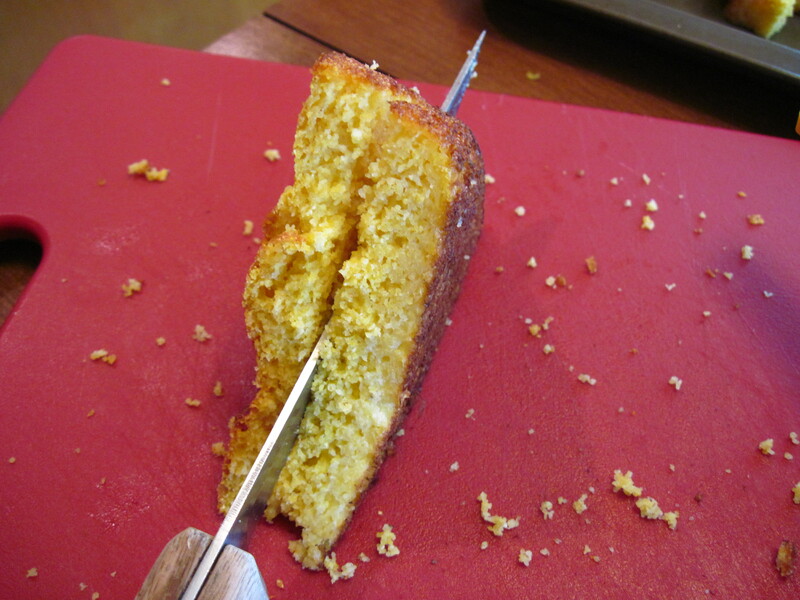 If wheat is not an issue, you can use 8 – 9 cups of your favorite cornbread. 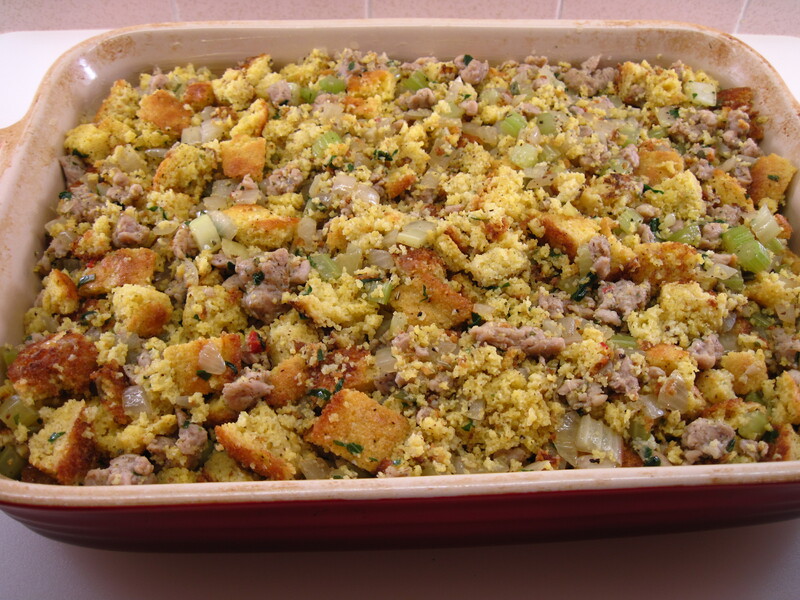 Cornbread Dressing with Sausage is most definitely a recipe I’ll be making again! 1. To toast the cornbread, preheat the oven to 400˚. 2. 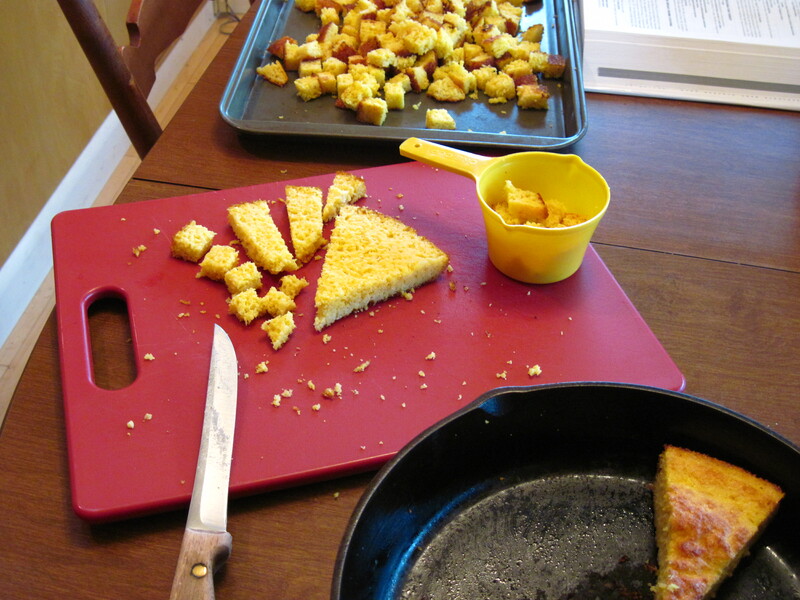 Cut the cornbread into cubes. Spread the cubes out on a large rimmed baking sheet and toast in the preheated oven for 10 – 13 minutes, stirring occasionally. Put the toasted cornbread in a large bowl. 3. Turn the oven down to 350˚. 4. Heat a large skillet over medium heat. Break up the sausage into the hot skillet and cook, stirring occasionally, until done. Remove the sausage from the pan and set aside in a medium bowl. 5. Add the ½ cup of butter to the skillet. When it has melted, add the onions, celery, and garlic. Cook for about 5 minutes, until the vegetables have softened a bit. 6. Add the cider vinegar to the pan. Cook for a minute or so, stirring up any bits of sausage or vegetables on the bottom of the pan. 7. Remove the pan from the heat and stir in the parsley, sage, poultry seasoning, salt and pepper. 8. Add the mixture in the pan to the bowl with the cornbread. Stir to combine. 9. Add the cooked sausage and the chicken broth and stir to combine. 10. Butter a 9 x 13-inch casserole dish. Spoon the dressing into the dish. 11. Cover the dish with foil and bake at 350˚ for 40 minutes. Remove the foil and bake for an additional 40 minutes. can you mix this up and cook it the next day? I can’t think of a reason why you couldn’t do that, Denice. Baking it cold from the refrigerator, it would just take a little more time in the oven. you don’t think it would absorb the broth and be soggy. Hmmm…..good point. Maybe you’d want to combine everything except the broth in your casserole, cover and refrigerate. Then when you’re ready to bake it you could stir in the broth. Really, just thinking out loud here. I’ve never tried it. If you do, I’d love to hear how it works. Thanks for you input. Since my mom passed we haven’t had any good cornbread dressing and your recipe sounds a lot like hers so I thought I would surprise my dad and make it. I think I will combine everything except for the broth and then add it when I am ready to cook. I will let you know how it turns out. Thanks again and many Thanksgiving blessings to you and your family. That’s so sweet of you to do that for your dad, Denice! I think it should work well. Do let me know and Thanksgiving blessings to you and yours, too! 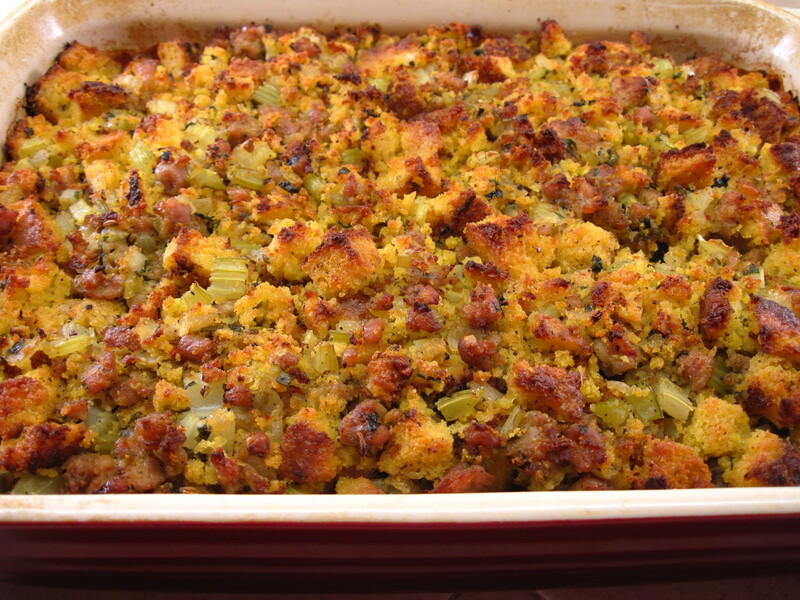 How did your stuffing turn out for Thanksgiving? I want to make it for Christmas and do it ahead of time, except for the broth. This recipe sounds really good. Never done a cornbread dressing. Please let us all know how it worked doing it ahead of time. Thank you, Kathdedon for posting this. Hi Kath – I want to use Italian Sausage instead of chicken. If using Italian, do I still need to use a broth? Too, I noticed the sausage was not completely brown after cooking and adding to mixture – I want to be sure the sausage is brown and crisp when cooked in dressing mixture.